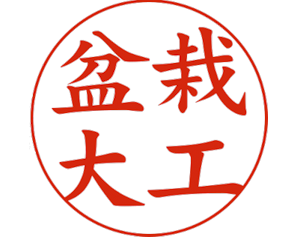 It has just turned 2018, and the winter tasks are in full swing. Re-potting, wiring, and deciduous tree development is in process. Today I started preparing the Daimyo Oak for its 58th year. Wiring must be applied carefully especially to the younger fleshy branches. The larger branches are still quiet movable. Daimyo Oak: 58 years old, Wire example of caged wire to prevent scaring. I am adjusting the front per the long term plan so some heavier wire (#14) was added to the heavier branches while (#16) was applied to the smaller ones. The wire is not tight on the branch; rather it is forming a cage as to avoid scaring and avoiding contact near a bud. In the last club show the top was incorrect due to strong growth at the apex. That is now corrected by moving a branch to the back. I have now positioned branches in anticipation of where the leaves will develop. Daiymo Oaks have a large leaf and the select branches must be designed so that they have room to sit in the design. The Apex is bent down to the front a bit in anticipation of new buds forming to create a back branch in that area. 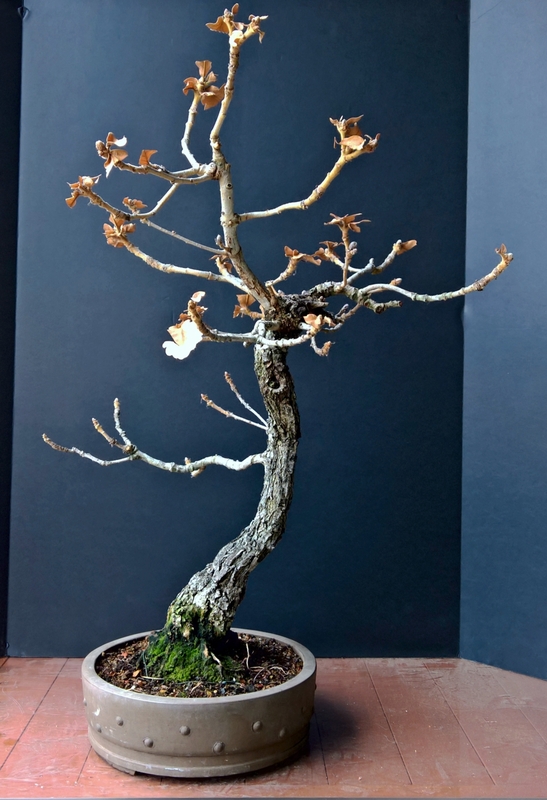 Daimyo Oak: 58 years old, After styling. 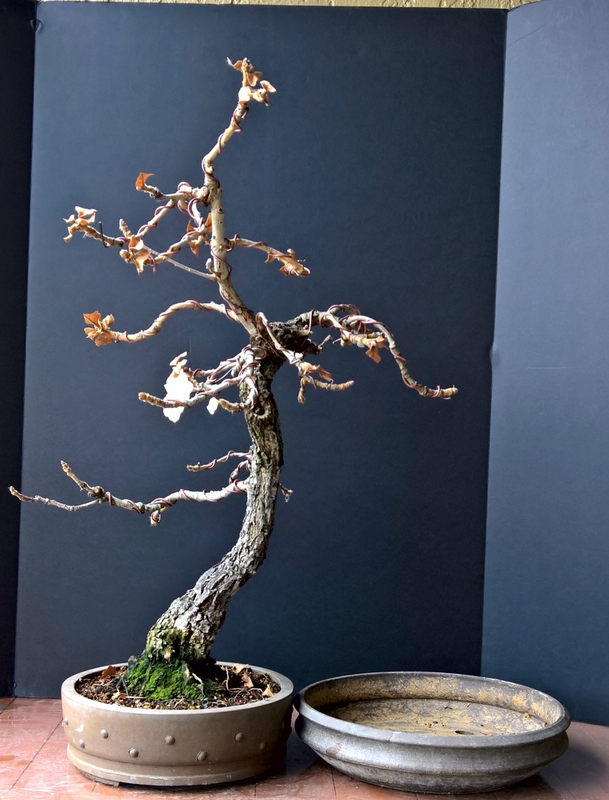 The Daimyo has been in this current pot for many years, simply being re-potted and returned to it. Next month as the buds begin to swell I will transplant it to a new pot more fitting to the size of the canopy and providing a bit more room for root development. 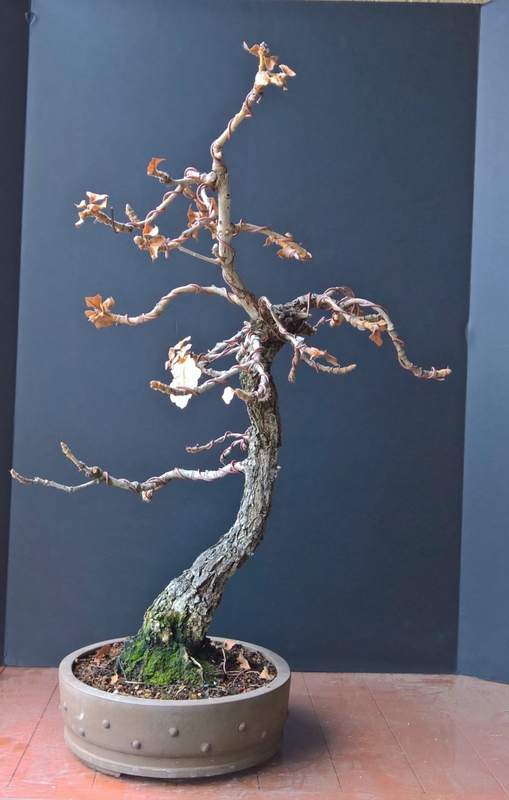 Daimyo Oak: 58 years old, After styling and with proposed new pot. I also starting working on a season favorite, Chinese Quince, as its leaves are just dropping and buds setting up for Spring. 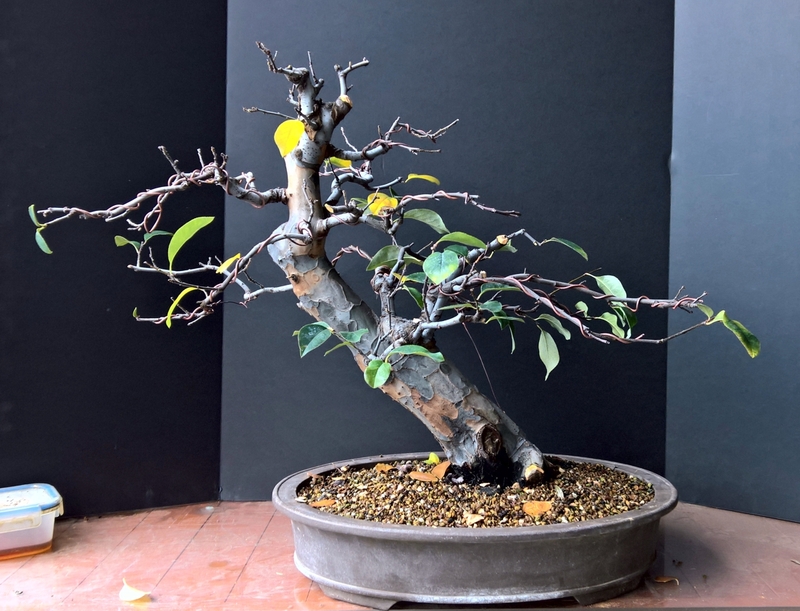 This is a young tree in bonsai terms and still needs considerable structural wiring and design. We had hopped for a tread graft to succeed but, alas, it failed. This means that an important leader branch on the left side is still missing. I am working to develop two branches in that area still. The tree is very strong on the right side and branches had to be cleaned out and carefully wired to get them in position. Many of those branches will be cut back during the next year as ramification occurs. 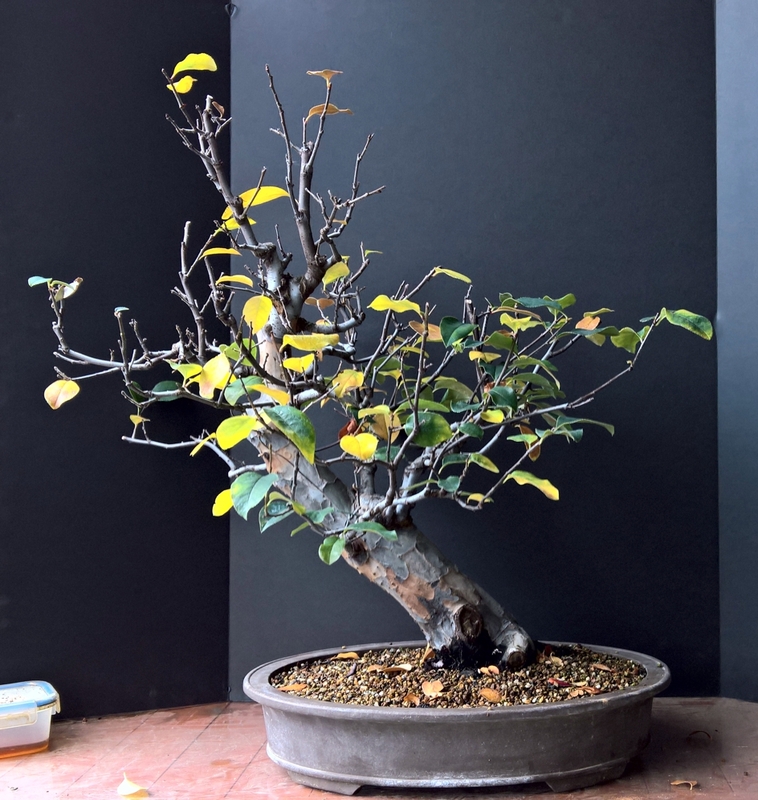 Chinese Quince 2018 before wiring. Tree has been in growth period for the past year. The top was greatly reduced. This tree has a very strong apex that I will need to control next year. The goal is to create a domed top instead of this point but I must be careful not to let the branches thicken as they did last year.